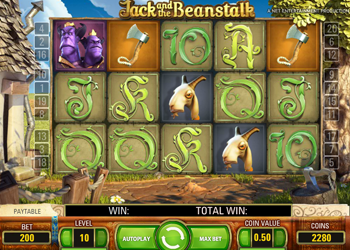 Jack and the Beanstalk is one of Net Entertainment’s most original and creative online video slots. As you will almost certainly be able to tell from the title, this slot is based on the fairy tale of the same name. Wonderfully animated with 3D graphics, this slot has plenty to offer players, even to those who aren’t naturally inclined to play fairy tale themed slots. Quirky and comical, Jack and the Beanstalk offers a unique set of special features, centered around Walking Wilds, which you simply won’t find in any other game. So, watch the video sequence at the beginning of the game, then get ready to enjoy what amounts to a simply superb slot. 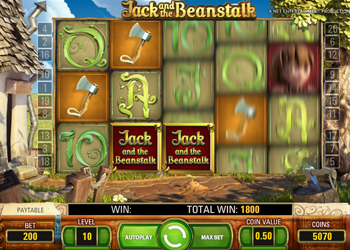 Jack and the Beanstalk is played over a total of 5 reels and 20 paylines, although you won’t be able to adjust any of those when playing the slot. What you can do is alter the value of your coins, as well as the amount of coins you wish to play per spin. Coin denominations can range from a low of only 1p up to a high of just 50p, and by using the betting level button, you can adjust your bets to anything from 1 to 10 coins per spin. Minimum and maximum wagers in the Jack and the Beanstalk slot stem from 20p per spin, up to £100 per spin. Net Entertainment have chosen to use the customary high playing card icons for its lowest paying symbols in this slot. Each of these icons has been designed in the style of a beanstalk, fitting the theme of the slot well. Players can win anything from 3 coins up to 100 coins with these icons. The better paying icons are those which pay homage to the fairy tale. Watering cans, axes, goats, the two-headed giant and Jack himself. Players can win anything from 8 coins up to 1,000 coins per winning combination containing these symbols. The Jack and the Beanstalk logo is the wild symbol in this game. When a wild appears on the reels, the player will land a re-spin. During the re-spin, the wild symbol will move one position to the left. Another re-spin will occur. Players will continue bagging re-spins as long as a wild (or other wilds) remain on screen. Once the wild has passed all the way to left (off the first reel), re-spins will end. These kinds of wilds are what are known as Walking Wilds. All winnings which are acquired with wilds will be multiplied by 3x their normal rate of pay, and wilds can replace all other icons save for scatters and key symbols. The chest icon is Jack and the Beanstalk’s free spins bonus. When three or more of these appear, the player will land 10 free spins. Players can win 5 additional spins, with every 3 scatters that they locate in the bonus. Whilst in that bonus round, players may be able to find keys on the fifth reel. The more keys they locate, the more of the Treasure Collection they will be able to unlock. If a player locates 3 key symbols they will unlock the Stacked Money Bags feature. Wilds then take the shape of moneybags and appear stacked in twos. Should the player collect 6 keys, they will unlock the Stacked Golden Hen feature. With this feature, all wilds will appear as golden hens and stacked in threes. Finally, if a player collects 9 keys, they will trigger the Golden Harp feature. In that feature, all wilds take the shape of a golden harp, and acts as expanding wilds. Jack and the Beanstalk is just one of many Net Entertainment slots which you can play at Guts Casino. Guts Casino have some top quality online video slot games to offer you, and several from other developers, too. If you aren’t yet playing with Guts Casino, you can sign up today to claim a welcome bonus worth £300, as well as bag 100 free spins on the Starburst slot, which is another top quality Net Entertainment title.